Ive always thought that you can best judge a city by taking a good walk around it early in the morning. You need to get out really early though, around five thirty, before the cleaners have managed to cleanse the streets of the nights various passions. Its the theory that a chain is best judged by its weakest link and at such a delicate hour, as a city stirs into life, all of its frailties and truths are laid on the pavements to be seen  and often trodden in. In New York Ive walked all the way from Battery Park, through Washington Square and on up fifth to central park  five miles in all. Ive walked nearly every street in central London and jogged through most of its parks, and one of my favourites, a walk from Union Square San Francisco up over Nob Hill, to get a view of Alcatraz, and then down to the Presidio. A good walk often gives the brain a chance to sort out most issues in life. But today Im in Lisbon on an early July morning and its a city bathed in a warm sunlight, made even more pleasant by a gentle atlantic breeze. First impressions are not good however. The streets appear to be mostly made up of sixties concrete blocks of one sort or another with filthy air conditioning units hanging out of most of the windows. Graffitti adorns the majority of buildings, in fact the graffitti adds the only element of real life to the brutal and failed architecture. I find one rather pleasant and large park, nestled between two busy roads. Some statues, lakes and a few small buildings give glimpses of a city of elegance, from a time long past. A city that has now mostly been wrapped in a concrete overcoat. 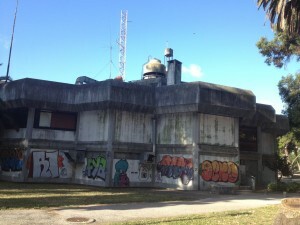 The beauty of even this green oasis with its wonderful ancient trees is however marred once again when I come across a huge concrete blockhouse of a building, looking like it has been dropped into place from above by the mother ship. Its just simply inhuman looking. Again it has been adorned in colourful and rather poetic graffitti. The building looks like some sort of genetic mutational cross between an oversized public convenience and the fuhrerbunker in its final days. I just stare and wonder what the architects of a generation ago were thinking? Was there really that much drug abuse in the sixties? Gropius gone very badly wrong. At *UP THERE, EVERYWHERE we have an experienced and international team of people who focus on working with clients in the life sciences – a focus we call UP* for Life. See the *UP THERE EVERYWHERE website for more details. In June this year I had the pleasure of taking part in a webinar focusing on the life sciences for the journal Science. On the panel with me was Hamid Ghanadan of The Linus Group and Bill Moran from Science. A link to view the webinar can be found here: http://bit.ly/AdWebinar We had a number of questions come in following our session and some of these are set out below along with the answers. VIEWER QUESTIONS It appears that truly successful branding is built on years in the industry. What about brand new businesses in the market with very small staff? Even big brands had to start somewhere- and normally they started small. The key is to work out what your most important customer touch points are and focus on these. It’s important to get the basics right- what your brand stands for, that everyone in your organization understands your brand and really ‘walks the talk’. Then focus – don’t spread your resources and especially money too thin. Instead do fewer things – but do them really well. What are the dos and donts for promoting “secondary products” without hurting the brand? This is always a tricky one and sometimes tempting. Over extension of the brand, and trying to grab more market share, can too often lead you into difficulties. If your secondary product is potentially damaging your primary brand you have to question the rationale for doing it  it ends up just confusing people as to what your brand actually stands for and represents. If this is the case you might be better off building a second and separate brand to fit the need. Only if the secondary product can meet a market need in an appropriate way and is on brand overall would I recommend it. In a digital world, how important is print advertising for a small company with a limited budget to build their brand? Today digital delivers an amazing capability to build a brand quicker and more cost effectively than ever before. However in building a brand you still need to reach the consumer in a multitude of ways  and print advertising still has an important role to play. In working recently with one client we found that digital was the medium that tended to reach our potential audience when they were at work, but that print advertising reached them most effectively when they were relaxing and reading a magazine. It was the combination of the two  and especially the print advertising  that worked well together. How do you build brand awareness internally – that is, within a company? Nothing is more important than the internal audience. If your own people dont get and understand the message your customers never will. We always put a big emphasis on In-Branding before we go external. Typically our programs for this would cascade information down through the organization, with short powerful two way learning sessions. You cant just broadcast the message at people, but you need to find ways to engage them. One recent example saw us running internal competitions through the companys own intranet, that was then followed up with internal brand engagement learning events organized at the companys major sites. Does any of this take a different flavor when working in the field of education? I think of all of the areas to work in education can be the most stimulating and powerful  few things are more important. Brand building work should always be carried out in an appropriate manner. Its about finding ways to engage with your audience in an appealing but relevant way. 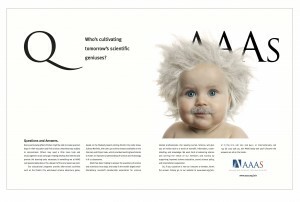 When we were helping build awareness of the educational work at AAAS we developed the baby genius image that really caught peoples imaginations – because it was relevant. Having worked for clients in the education area a number of times the danger can sometimes be that ideas can be developed by committees and tend to get watered down. Great brands still need to take a stand and establish a point of view – which might sometimes mean not pleasing everybody.